The (somewhat) good news: according to the newly-released 2013 American Community Survey (ACS), housing cost burdens declined for the third straight year in 2013. Last year, 39.6 million households spent more than 30 percent of their income on housing, down from 40.9 million in 2012 and a peak of 42.7 million in 2010. Still, just over a third of U.S. households (34 percent) were cost burdened in 2013, including about a quarter of all homeowners (26 percent) and half of all renters (49 percent) (Figure 1). Notes: Moderate (severe) burdens are defined as housing costs of 30-50% (more than 50%) of household income. Households with zero or negative income are assumed to have severe burdens, while renters paying no cash rent are assumed to be without burdens. Last year’s decline in the number of cost-burdened households, however, occurred almost exclusively among homeowners. 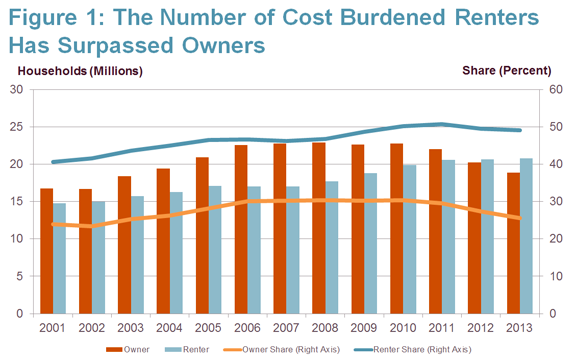 Nearly 19 million owners were cost burdened in 2013, down from 20.3 million in 2012. The number of owners with severe cost burdens – paying more than 50 percent of income for housing – also slid, from 8.5 million in 2012 to 8.1 million in 2013. 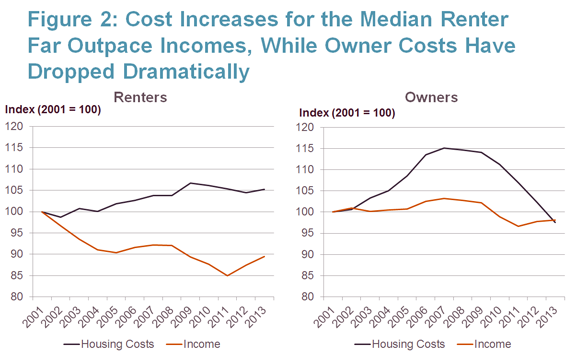 The easing of owner cost burdens is due in part to a dramatic decline in median homeowner housing costs. After surging during the housing bubble, inflation-adjusted owner costs have dropped to about 2.5 percent below their 2001 level (Figure 2). Owner burdens are also down due to a significant reduction in the overall number of homeowners – fully 294,000 fewer households in 2013 than 2012. This decline in the number of homeowners for the third straight year (and the fifth time since 2007) suggests that many burdened owners dropped out of ownership, moving into the costly rental market. Notes: Median costs and incomes are real values adjusted using the CPI-U for All Items. Owner housing costs are first and second mortgage payments, property taxes, insurance, homeowner association fees, and utilities. 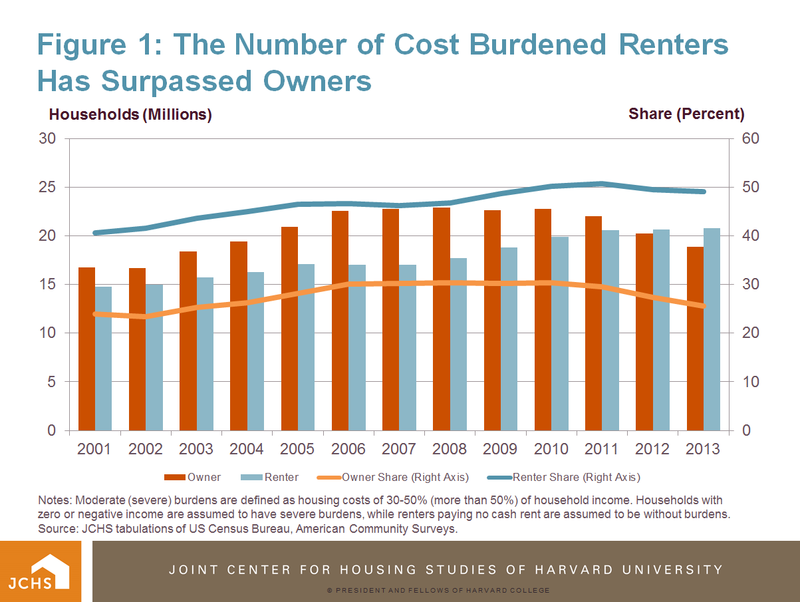 Renter housing costs are cash rent and utilities. With many exiting ownership and new households forming, the number of renter households was up by 615,000 in 2013. Indeed, a major reason why renter cost burdens remain persistently high is that the overall number of renters continues to grow. Despite a slight decline in cost-burdened share, the sharp growth in renter households pushed the number with cost burdens up for the twelfth consecutive year, reaching 20.8 million in 2013. Of these, about 11.2 million were severely burdened in both years. 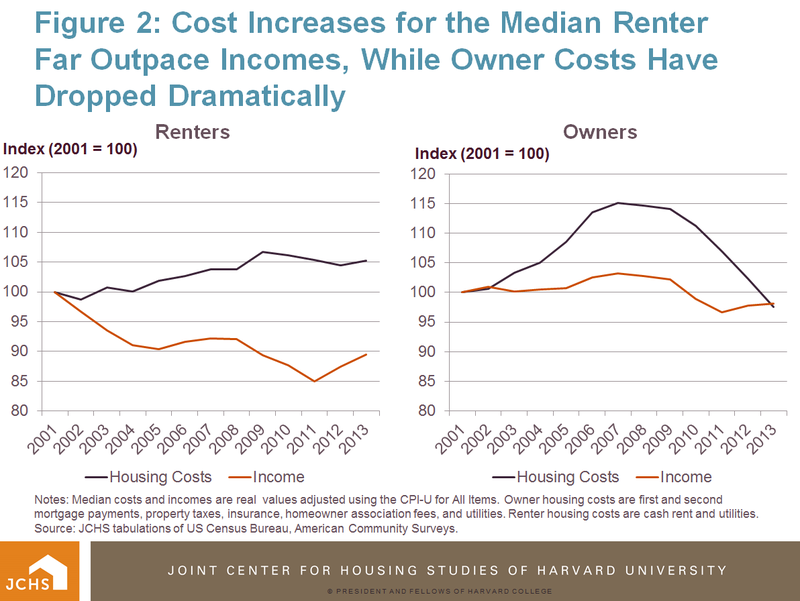 Cost pressures also continue to drive burdens higher as over the past decade, renter costs have largely gone up, while renter incomes have declined. As Figure 2 shows, real median renter costs in 2013 were about five percent higher than in 2001 while, even with modest income gains in 2013, median incomes were nearly 11 percent lower. If past patterns hold and income growth remains stagnant, rental costs continue to climb, and affordable ownership stays out of reach, rental cost burdens will only continue to grow.